Have you ever come across a recipe that just transports you back to another place and time? The smell of the item cooking, the flavors of the dish, an emotional connection to the preparation? I have a few of those, and they all have one thing in common. They are all – every single one of them – learned from my Grandmother. The recipes that are the most sentimental to me, the most powerful, the most comforting, are each connected to memories of her in some way or another. One of these recipes that is particularly connected to her are sausage balls. These little gems are a southern staple, and were reserved for holidays, weddings, and travel. 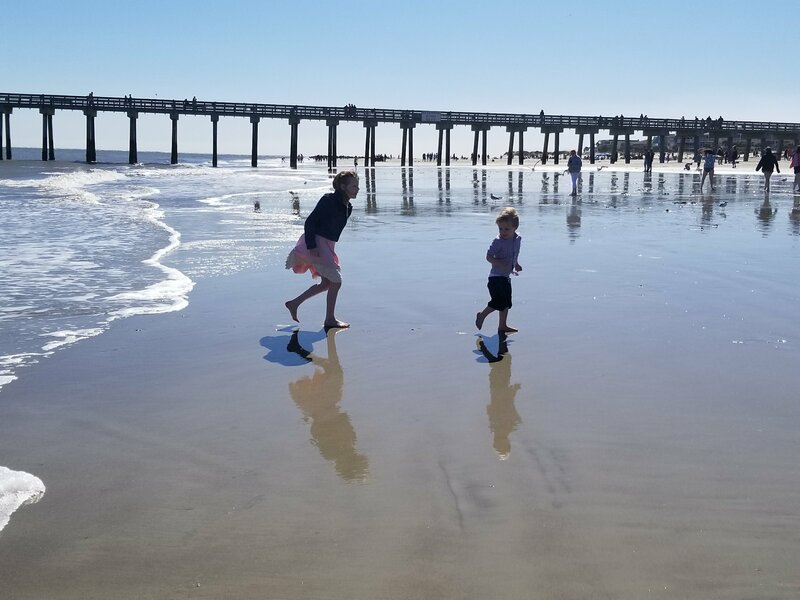 My family were believers in packing snacks as opposed to buying snacks for a road trip – I opt for healthier options today, but I still do it with my kids. 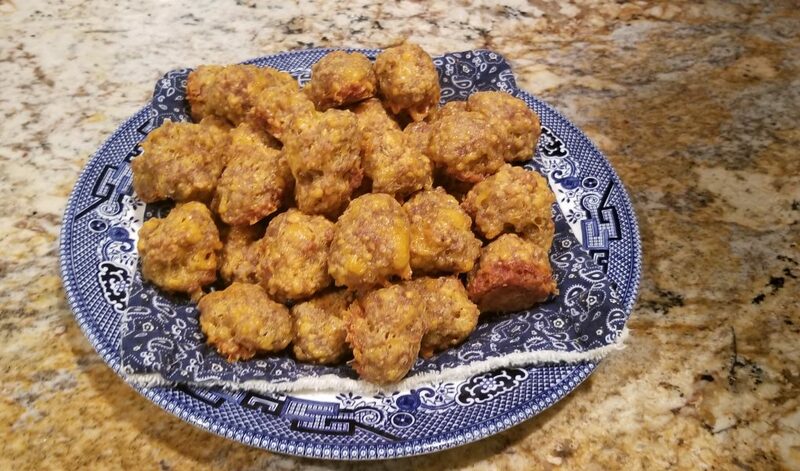 Sausage balls are easy to make, and if prepared ahead, can be frozen until you are ready to thaw and bake. I like to prepare big batches of them and freeze them individually, then, when I need them, take out what I want and bake. I especially like to do this at the holidays. I am notorious for serving these as a quick breakfast or with fruit and yogurt for brunch when I have a house full of family – so much easier than making biscuits, sausage and eggs, and they have almost all the same ingredients (no eggs). On snow days, especially cold weekend mornings, or special occasions, I still pull these out of the freezer to add a little touch of sentiment to the moment. I love the warm and spicy hint of home that these always evoke, no matter where I am. Let sausage and cheese come to room temperature before you work with them, but be careful with your sausage – you don’t want bacteria to start to grow. I usually let it thaw in the refrigerator overnight if I can’t work with it fresh. Grate cheese yourself. While pre-shredded cheese works, I find that I get better results in texture and flavor when I grate the cheese from a larger block. In a large bowl, mix all ingredients thoroughly. There is no way to do this gracefully. Don’t even try. You are going to have to wash your hands, roll up your sleeves, take off your rings, and go at it with your mashing fingers. Roll quarter balls that are roughly quarter sized. These can be placed on a cookie sheet with a bit of room between them and frozen, then transferred to a zip lock bag to store them until ready to cook. When ready to cook, place in pre-heated oven (400 degrees F) for about 20 minutes. You will want to remove them to a paper towel lined plate to drain. These sausage balls sound so good! 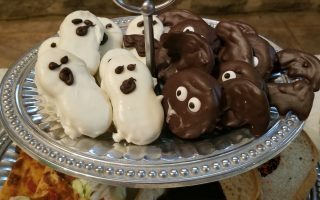 I have to try them for our Holiday party coming up! My Grandmother used to make them for us. I love how easy they are! These look so good. Definitely going to give them a try. They taste like childhood to me. I have to admit, those look yummy! And EASY! Perfect for school lunch finger-food, I bet! I haven’t tried that yet, but that is a great idea.